Team Tennant: Sanctified by Adoption, Part 3: Praises Abound! 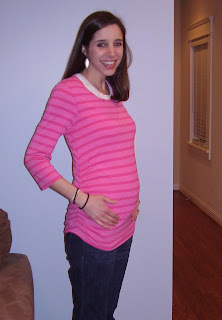 Between the two of us, my husband and I know a little bit about fetal development. Paul has studied medicine for the past 7 years and will continue to do so for the rest of his life. Even though obstetrics isn't his medical specialty, he assisted in delivering babies during medical school, and his ability to recall information regarding fetal development impresses me. These days, he can tell you anything you want to know about when certain parts of the ears, nose, and throat develop (I should add that when he was recently quizzed during his vigorous studies for his yearly boards test, his lovely wife beat him to the punch in answering questions about fetal development!). So when we found out that we were pregnant, we needed no convincing of the life that was already created. We knew that at 18 days after conception, the baby's heart began to beat. We knew that at the moment that the baby was conceived, all of the baby's genetic material was there; this was already a boy or a girl. Gender, height, and eye color had already been determined. This was a little life inside of me. Until I remembered our soon-to-be-adopted child. And there loomed all-consuming guilt. How could I let myself feel such attachment to this biological child when there was another baby across the world that I'm being called to equally love, protect, provide for, and disciple? Feeling a sense of helplessness, I would despairingly fret, "I know nothing about this child across the world!". The unknown about the child we hope to adopt aggravated me, as it's very difficult to attach with a child whom you've not seen, whom you know absolutely nothing about, and for whom you are still awaiting a referral. These daily thoughts routinely ended with sadness and frustration, and knowing that it wasn't healthy to feel guilty for being excited about our developing baby, I began to pray that God would help me think rightly about all of this. And I am ceaselessly thankful to believe in a God who answers prayer- a God who cares about His children's seemingly trivial thought life- a God who delights to make them more like Him- a God who changed my guilt into compassion. And He began to help me think rightly about all of this: each time that I would think about the baby inside of me (which, if you have been or know someone who has been pregnant, you know that endless hunger/feeling absolutely starved serves as as a constant reminder of that baby! ), I began to feel compassion for our baby across the world. I decided to embrace the truth about our biological child: a baby who is being very well fed (! ); a baby who is under excellent healthcare; a baby who will come into the world at a stable hospital with a mommy and daddy who have eagerly awaited this baby's entrance into the world; a baby who will be welcomed by numerous grandparents, aunts, uncles, and friends- all with balloons and stuffed animals in hand. And what pity these thoughts would create for our other child: a child who was likely conceived under difficult circumstances; a baby whose mother has likely limited education regarding prenatal care and little or no access to good healthcare; a baby whose parents assumably live in danger and poverty; and a baby who will be sent to an orphanage due to devastating circumstances. To my surprise, the guilt vanished as these thoughts broke my heart for the orphan child who needs a home. And how thankful I am to God for taking a pregnancy that initially felt like a hindrance to my desire to love this unknown child across the world and for using this baby to increase my love for our soon-to-be-no-longer-orphaned child! Nowadays when Paul "pats the baby" on his way out for work - or when we gaze at the little bump growing inside of me- or when my doctor allows me to hear the racing "bum-bum, bum-bum, bum-bum" sound inside of me, I unashamedly thank God for this precious miracle. And then I remember our other little miracle on the other side of the world who cannot comprehend the unending, Spirit-enabling love that he or she is about to be shown for the rest of his or her life. And I am filled with praise, as the anticipation only builds. We love the Tennants! So thankful for how God has blessed you both! Your story is beautifully told. You're an excellent writer, Sarah. Hey Sarah!!!! Such happy news!!! You look great!!! So y'all had started te adoption process and then found out you are preggo !!! Sooo exciting!! OMG! it's a little baby bump! I can't wait to see you all this weekend!